Passionate about entrepreneurship, helping build great teams and making a difference. I try to keep up to speed with the mobile economy mostly through Business Insider, TechCrunch and comScore apps on my iPad. Every week that goes by the numbers are just mind boggling when you think of where things are compared to 2007 when the iPhone launched. I think some valuable leading indicators for measuring the impact the mobile economy will have on IT spending are (1) smartphone penetration, (2) app development and downloads, and (3) tablet shipments. So, for the last couple weeks I have earmarked several factoids as I have come across them and decided I would just post them so I can look back on them at some point in the future. The global per-capita rate of smartphone penetration surpassed that of personal computers sometime in the latter half of 2012. By the end of 2013, global smartphone penetration will have exploded from 5% of the global population in 2009 to 22%. That’s an increase of nearly 1.3 billion smartphones in four years. On average, there will be two smartphones for every nine people on earth, or 1.4 billion smartphones, by the end of 2013. Cumulative app downloads have surpassed 60 billion. That means cumulative app downloads, the total number of apps downloaded since the inception of the app store, have grown 50% in the first 10 months of 2013. There are now over 1 million apps available in Apple’s App Store. Apple has paid out over $13 billion to app developers to date. Since Apple pays out 70% to developers and keeps 30% of revenue, that equates to roughly $18.5 billion in total app store revenue, which is roughly 86% growth year-to-date. As things stand, as of September 2013, 6% of the global population own a tablet, 20% own PCs, and 22% own smartphones. Tablets are showing faster adoption rates than smartphones. It took smartphones nearly four years to reach 6% penetration from when the devices first started to register on a global level. Tablets accomplished this in just two years. PCs have only gained 6 percentage points in per-capita penetration the last 6 years. How big are these 3 things combined? Smartphones, Apps and Tablets. Research outfit IHS recently compared the history of combined smartphone and tablet revenue to revenue from the broader consumer electronics (CE) market to compare future revenue trajectories for both markets. 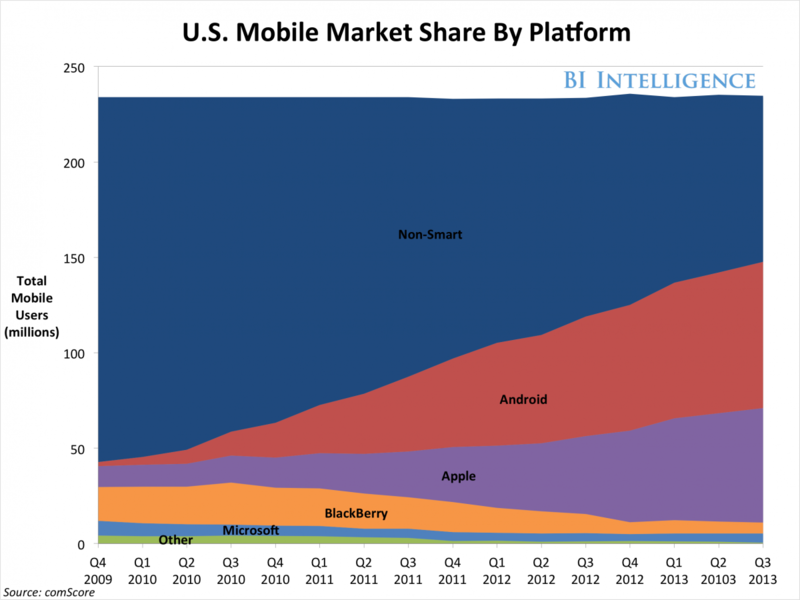 In doing so, IHS found that smartphones and tablets will combine for about $355 billion in revenue this year. Add the $18.5 billion from the Apple App Store and you have almost $375 billion. This is 9% higher than the expected revenue for the entire CE market, which is roughly $344 billion. IHS defines the CE market as a broad category that includes televisions, audio equipments, cameras and camcorders, video game consoles, and home appliances. Remember these numbers. I will be coming back to check them in the future. November 14, 2013 in Everything Mobile.